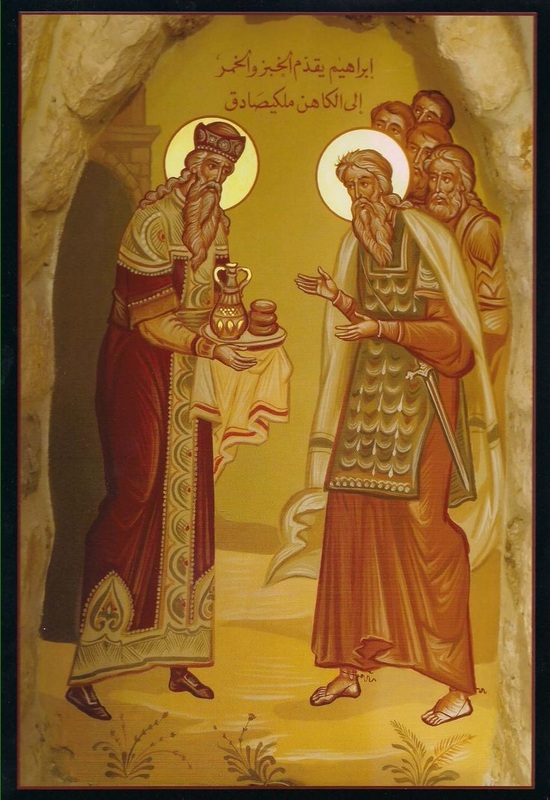 The priest- king of Salem, Melchizedek, appears for only a moment in the Genesis accounts of Abraham's activities. Abraham has just won a remarkable victory, defeating a coalition of five kings and rescuing his kinsman, Lot. As a king, Melchizedek's hospitality might be as much about good politics as recognizing divine blessing. And it is likely that in his original context, Melchizedek invoked the chief Canaanite deity. Nonetheless, Genesis is interested in this confirmation of Abraham's special status and thus the pagan king properly invokes the God Who is author of Abraham's victory. Abraham's response to Melchizedek is gracious and likewise keeps the focus on the Lord. Notice the respect that Abraham accords this king who offers the proper accolade - one to God, The King of Sodom will make the mistake of attempting to reward Abraham and will be rebuked for the gesture. Despite the brevity of the encounter, it served in later ages to provide a precedent for another king of "Salem" (Jerusalem), David, who would also play a priestly role in the worship of the Most High. This tradition is recorded in Psalm 110. The Letter to the Hebrews and the early Church Fathers picked up on this encounter as well. For them, Melchizedek was a type for Christ - another High Priest outside the Levitical rolls and one that will likewise offer bread and wine. This Psalm has clear royal associations. It may have been used in coronation settings or upon the anniversary of coronation. It acclaims the King of Jerusalem and brings up that brief encounter with the ancient king of the city that preceded David - the city of Salem. That priest-king becomes precedent and model for the Kings of Judah. But the Psalm goes beyond acclamation to oracle - the figure here described exceeds the earthly kings of Judah. The New Testament, already interested in Melchizedek's offer of bread and wine sees this exalted language as prophetic of Christ the Priest-King of the universe. Paul's letter to the Corinthians is among the oldest documents in the New Testament. It is therefore crucially important to note that this passage describes the Eucharistic celebration as having been handed on/over - in other words, the practice is already established by the time Paul writes this letter. And most date the letter to the early 50's. The account parallels the Lukan Last Supper account, but remains distinct. The focus here is upon "remembrance." In the Jewish Passover tradition, remembering is in fact participating in the events that are remembered. Likewise here, this is no memorial. It finds its context in Paul's repeated appeals to disciples to live in the Lord - to unite themselves and the whole of their experience to the Lord Jesus. All four gospels give an account of a miraculous feeding. Clearly something extraordinary occurred and that something loomed large in the early christian understanding of Jesus' ministry. The Lukan account of the feeding is set in a series of interactions between Jesus and others - interactions that offer a variety of responses to Him and His ministry. Immediately following this account, Jesus shifts the focus to the prediction of His passion, linking the miraculous feeding to the cross. Like all four gospels, the Lukan feeding must be read agains the OT background of a God Who provides for the people. In the "wilderness" of Sinai the Lord guided, fed, and watered the people. They were entirely dependent upon divine providence for their survival during those vulnerable years. And so it should not be an surprise to see the Son of God and Messiah exercising this divine prerogative to show compassion and to care for the people. The miraculous abundance underscores that this is no ordinary moment with a generous benefactor. This is a miracle worthy of the Sinai manna. In the Lukan setting, the meal also recalls the other instances where Jesus participates in meals. In fact, meals are a place of encounter with Jesus for the folks within the Lukan narrative - and presumably remain so for the hearers of this gospel. At the same time we should note that the NT offers these accounts with the celebration of the Eucharist in mind. Granted, the Last Supper has not yet taken place within the narrative, but the Lukan community experienced Jesus in "the breaking of the bread." Their ordinary way to encounter the Lord and hear His word was in the eucharistic setting. Therefore, this account calls that setting to mind. The "fragments" that demonstrate the superabundance of the miracle are called by the same terms applied by early Christians to the Eucharistic species. 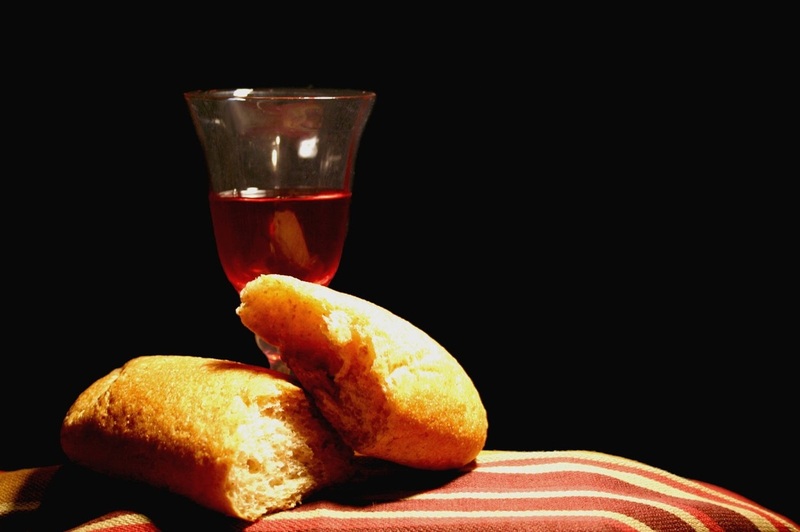 That same abundance continues to sustain the Church and they receive this new manna through the gift of the Lord's Supper. 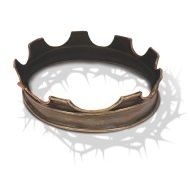 There too, the feeding is linked to the passion and cross of Jesus. In fact, in Luke at the Last Supper, Jesus interprets the significant of His death in the gift of the Eucharist. The disciple receives this abundance from the Lord in His Supper and participates in His life - including His suffering and death.